First off, I’m not talking about this Blog Tycoon, which I just found today. I’m not exactly sure what’s supposed to be fun about that game. It looks like a gimmick to get people to visit the blogs in their ad network. I’m talking about something much more exciting. I guess we’ll have to change the name though. Might I suggest getting WordPress, Blogger, Live.com, TypePad (yuck), or someone else to sponsor your game and call it WordPress Tycoon or something similar. Part of the business model of Stranger Studios is to incubate business ideas. We specialize in the prototype and the early startup phase of things. We have a long long list of business ideas. Some become prototypes that never get released to the public. Others are released, like Interactive 8ball and Mobilicio.us, but aren’t heavely marketed or developed further. When a site gains some interest and traction, we devote some more resources to it. WineLog is one such project that has graduated to the next level and will be spun off as businesses of their own. Our original intention was to sell our projects once they reached the phase WineLog is at. The truth is that we just don’t have the experience growing from a functional startup application to a full-fledged business. However, we’ve fallen in love with the project, and are instead bringing on some outside help to continue to develop the business “in house”. Now most of the ideas in our bank are never going to be acted on. We just don’t have the time and can only focus on the projects with the most potential, or ones which interest us the most, or ones which we can bang out fast, or ones that will gain us contacts at Yahoo!, or ones that will draw the attention of TechCrunch… you get the idea. And so another important part of the Stranger Studios business model is to give out some of these ideas to the public. If we’re not going to act on an idea, we’d like to put it out there. I’ll be posting these ideas either at the Stranger Studios blog or here at random intervals. Maybe someone will pick it up and make it happen. If so, we only ask that you give us credit. Maybe someone will learn something just from the idea itself. Maybe we’ll learn something from the feedback the idea gets, which will help us come up with even better ideas in the future. Now I don’t want to suggest that I am some kind of business genius. Most of the ideas I have are probably on the minds of at least 10 other people. However, I’m pretty smart and I do think that most of these ideas are cool. In any case, here is the first idea to be orphaned from the Stranger Studios bank. The following is far from a complete design document. It’s meant to get the gist of the game idea across. I wouldn’t be opposed to consulting on this if someone does take it up. Just get in touch. Blog Tycoon would be a game in the vein of those lemonade stand games we all played growing up (here’s a decent lemonade stand game) and all other “Tycoon” games: RollerCoaster Tycoon, RailRoad Tycoon, Drug Dealer Tycoon, etc. 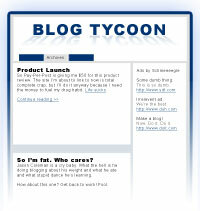 In Blog Tycoon, your goal is to create a successful blog site or network of blog sites. Your score would be a combination of popularity, power, and of course money earned. The other “currency” that players will start out with is their writing time. Every day players can write 3 blog posts. This number would go up later as players gain “experience” and/or hire staff. Each blog post will be of a certain type: either (1) personal, (2) link bate, or (3) revenue generating. This roughly corresponds to the blogging decisions we made at InvestorGeeks. Each type of post would affect your Google hits, subscriber numbers, and ad revenue in different ways. Alternatively, you could forgo 1 blog post and instead write 2 comments on other blogs. Perhaps there would even be a fake Google Analytics for you to figure out who is linking to you so you can go comment on their blogs. The comments would help to bring your blog to new readers at the expense of a bit of content. Eventually, you’ll have to use some of your profits to move to new hosting, hire designers to spiff up the site, and possibly bring on new writers. You can try a revenue sharing model, which will likely fail (it’s so hard to split that $8 up between 5 writers every month). Then a flat rate model or % stake model. By the time you are ready to start a second blog, you’ll probably have enough experience earned up to be posting like 5-8 posts a day. You’d have to figure out how to split these posts up between your blog network. Think of how much better TechCrunch is when Arrington is posting 5-times a day vs. when he’s on vacation. You might want to focus on the new blog to bring it up to speed, but multiple posts on the same day will always have diminishing returns. The idea of experience in general could be pretty cool. I see players “spending” points to earn new abilities like: faster writing, better writing, better negotiating skills, upgraded affiliate rates, who knows. Little side note: a cool feature would be to scrape real blog posts from the web to populate the in-game blogs. And what about getting into blog wars with competitor sites! Ooh, this game is just ripe for fun. Eventually, you’ll hire other staffers to run the books, find direct advertising, and negotiate your sellout deal with AOL. That’s about it for now. I would have a tremendous amount of fun with this game. I imagine other folks would too. Think of all those aspiring entrepreneurs trying to make a living off their blogs. They (we?) check their adSense accounts everyday and can’t wait to see how many RSS readers they’ll have tomorrow. With this in game format, a day would become 30 seconds… which would make me a millionaire blog tycoon in just a few hours instead of a few years. Let me know what y’all think. What would you add to a game like this? Like I said, I don’t have time to program this, but I wouldn’t mind being involved if someone does take up the idea. This entry was posted in Free Ideas, Games and tagged . Bookmark the permalink. In my first attempt to port content from my old site to my new blog-a-licious site, here is a link to download the installer for my tetris-esque puzzle game “Puzzle Dropper”. This entry was posted in Games, Old Blog and tagged . Bookmark the permalink.